Rancho Maria, the 2nd bonded and licensed winery in Pima County (as of September 2011 [edit: Charron Vineyards is actually the first]), had a somewhat disappointing yield per acre this year, but that just means the fruit harvested during the 2011 season will yield dense, complex wines. Danielle and I spent a few hours on September 4th harvesting Grenache with owners Mark and Maria Mabry and a few other ranch hands. The wasps and ants hung out with us for a while as well, but everyone came out unscathed, though Mark may have ruined a perfectly nice outfit at the de-stemmer and press! Wine is primarily cellared for two reasons; first, to allow the wine time to improve with age, and second, to stock up on a particularly good vintage. In Arizona, our relatively warm ambient room temperatures and lack of basements makes cellaring wines difficult. Tannin, acid, alcohol, and sugar are the primary “preservatives” in wine. Each in its own way acts to extend shelf life. Generally wines need to be 11 or 12 percent alcohol by volume in order to be shelf stable, but if other constituents are a bit higher, less alcohol is required. For example, some of the best German Rieslings (with higher acid and some residual sugar) can age well for decades, but they often have less than 10% alcohol. Room temperature in most homes in the southwest is around 78° Fahrenheit. This is entirely too warm for long term storage of wine. Wines with a lot of tannin, sugar, acid or alcohol may hold up well for a few years, but lighter wines (most whites, rosé’s, and nouveau style wines) may become noticeably “off” in as little as six months. Cellaring wine may have started in the middle east, but the practice may not have been common until corks were perfected as bottle closures. The widespread cellaring of wine appears to have started in Europe. The practice may have started in natural caves and castle cellars. Before that wine spoilage due to porous vessels and closures would have complicated the long term cellaring of wine. Even though we normally think of a wine cellar as a below-grade room, a cellar may be above grade or it may just be a cabinet or a cooler of some type. We’ll explore a few options in this article. As wines age a number of different organic processes occur; tannins bind with other molecules and precipitate out of solution, color fades (in reds), acid reacts alcohol to form esters, etc. 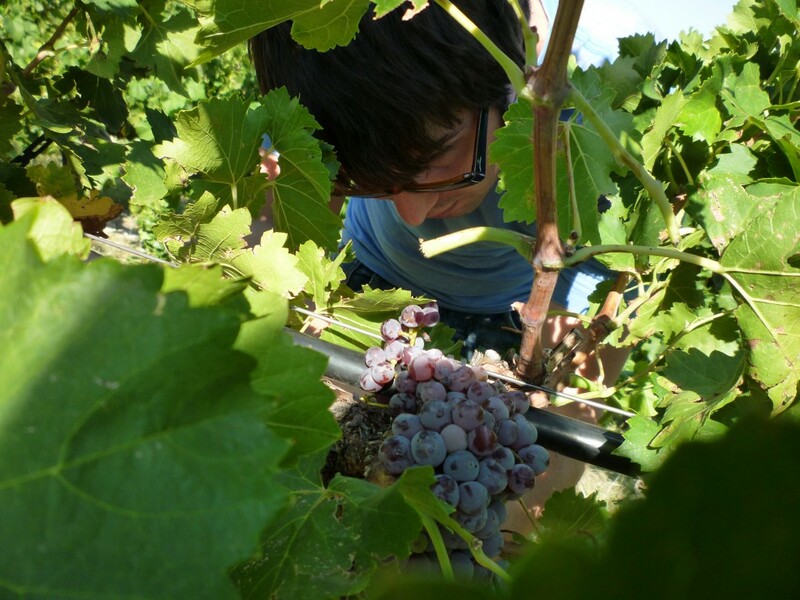 Combined, these processes radically change the character of a wine over it’s life. Many wines though aren’t suitable for long term aging. Most whites, rosé’s, and some lighter reds lack the combination of constituents necessary for long term aging. The benefits of aging wine have long been understood. In the bible, Luke 5:39 reads “And no one, after drinking old wine wishes for new; for he says, ‘The old is good enough.’ ” The ancient Greeks and Romans aged some wines. In fact, they generally thought of wine in terms of its condition or age, rather than varietal or appellation. The most sought after wines were those with the best aging potential. Unfortunately, microbiology was poorly understood in ancient times, and most vessels and closures lacked the integrity necessary to protect wines from oxidation or contamination. The most important consideration when cellaring wine is temperature, but few agree on a single ideal temperature for cellaring wine. Generally 50 to 60° Fahrenheit is recommended for most wines, with whites and sparkling wines being cellared at the lower end of that spectrum, and reds at the higher end. But I prefer to cellar everything at 61°. A warmer cellar will more quickly age wine. Kept too cold a wine won’t experience the full benefit of aging; kept too warm it’ll age too quickly and develop “off” flavors. But 61° seems to work well with wines aging gracefully but perhaps a bit more quickly, without developing any faults. It’s important to note that changes in temperature are undesirable as well. A cellar that stays at a constant 65° would probably be better than one that experiences seasonal changes from 50 to 70°. Temperature changes like this can compromise the cork by way of expansion and contraction of the wine, which may lead to oxidation or other issues. Humidity is likely the second most important consideration. 55 to 75% is considered perfect. Any higher than this and mold may develop on labels and corks. Less than this can prematurely dry corks. With our early summer humidity levels hovering around 5%, you may think that achieving 55% would be a problem. In fact inside most homes in the southwest, humidity levels stay at a reasonably constant 30 to 35%. This humidity comes from showers, washing dishes, and simply exhaling. If extra humidity is required, a small water fountain may be used in larger cellars, or a bucket or tub of water in smaller cellars. Corks rarely dry out though even over several years of cellaring when no extra sources of humidity are provided. Light is also an important factor. Anyone who enjoys wine and has a sizable collection will likely want to be able to see it, but direct sunlight or even a bright artificial light can bleach the color from wines. Tinted glass and the lack of a persistent light source are both important features for cellars. Finally, vibration should be considered. In my opinion this is among the least important considerations. The concern is that vibration may “unsettle” the wine and interfere with proper aging. Less expensive wine cabinets and refrigeration units may have compressors or motors that vibrate and interfere with aging. In my view this really isn’t that much of an issue. Even a small cooler holds about fifty bottles of wine. The combined weight of that many bottles should quiet the vibrations of even an out-of-balance motor. No discussion of cellaring would be complete without some mention of corks and closures. Cork is the bark of the Cork Oak tree. The first recorded use of cork as a stopper was thousands of years ago in Egypt, but it wasn’t until the 1600’s when a French monk named Dom Pérignon developed the use of cork for sealing sparkling wine. Gradually the concept gained widespread acceptance and around 1750 the first cork stopper factory was opened. That’s quite amazing when you think about it. A lot has happened in the last three hundred and fifty years. Surely there are better options for bottle stoppers than cork. Why then are we still using it? In part the answer is “tradition”. People expect to see cork stoppers in quality wines. Screw caps (aka Stelvin caps) got a bad rap years ago when they were used on less expensive wines. A wine bottle with a screw cap became a bit of a joke. This is unfortunate because there’s nothing wrong with screw caps. Synthetic stoppers are being used on more and more wines, and screw caps are starting to come back into fashion, but natural cork still reigns supreme. Why not use cork then? There are a few big problems with cork. The big one is TCA or “cork taint”. A small percentage of wine sealed with cork goes bad. Chances are that you’ve had a wine with this fault, but if you didn’t know what you were looking for you may not have realized what was wrong. Another problem with corks is oxidation of the wine caused by the cork drying out. 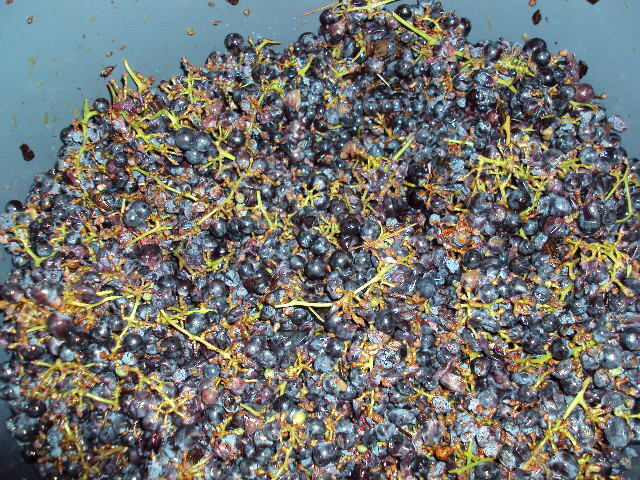 This can be more of a problem in the desert southwest due to our exceptionally low humidity in the early summer, but this is rarely an issue with cellared wines that are laid down on their side. In much of the United States homes are typically built with basements. But in Arizona, they are a rarity. Why is that? The Hohokam Indians certainly understood the benefit of below-grade construction. Their pit houses were dug-out leaving the floor roughly 3 to 6 feet below grade. They understood the insulating capability of the earth, so why is it that modern homes in the desert southwest are built above grade? It’s all a matter of cost. Home builders want to build homes one right after another without any delays or problems. Our caliche soil is difficult to dig through. Many years ago dynamite might have been used to loosen the soil for a basement. Today of course that’s not an option. Heavy equipment must be used to remove the soil, and the excess has to be dumped somewhere. This takes time and adds cost. More and more custom and semi-custom homes have as a build option a basement or even a wine cellar, but the vast majority of us are stuck without one. Even if you are lucky enough to have a basement you’ll need to take steps to provide artificial cooling (A/C) since the average temperature below grade here is still too warm for wine storage. You Can Have a Cellar! Don’t become discouraged by the slab foundation you’re sitting on. There are many options for cellaring wine; some are more accessible than others. Let’s explore a few. One of the most impressive residential or small winery below ground wine cellars I’ve seen is that of Purple Grin Winery in Escondido, California. 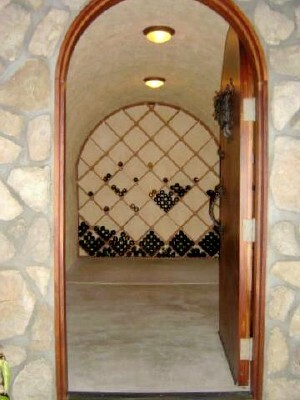 Believe it or not this wine cave is actually a DIY project. 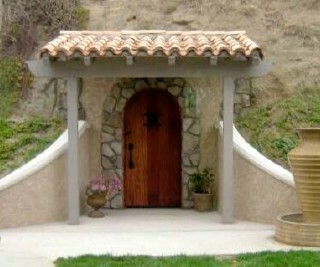 These folks burrowed into the hillside behind their home and built this expansive cellar. I take on a lot of big projects but this one might be too big for me. The wine cave extends seventeen feet into the hillside. They had to remove a huge volume of rocks and dirt to make this happen. The “X” or diamond racks at the back hold some 700 or more bottles of wine, but the floorspace is enough to hold many thousands of bottles of cased wine or numerous wine barrels. While Escondido is cooler than central Arizona, supplemental cooling is still required during the summer months. That is provided by a 700 BTU/h cooling unit which keeps the temperature at a perfect 60° Fahrenheit in the summer. Few of us are lucky enough to have a hill sitting in our backyard, so we need to consider other options. 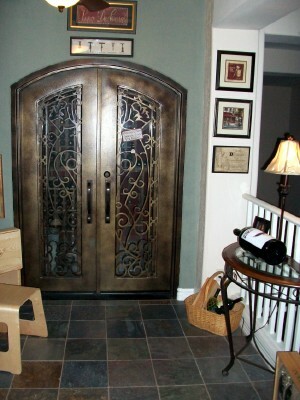 If you have some unused floor space, you can build an above-grade wine cellar. There are a number of cooling units available for this. 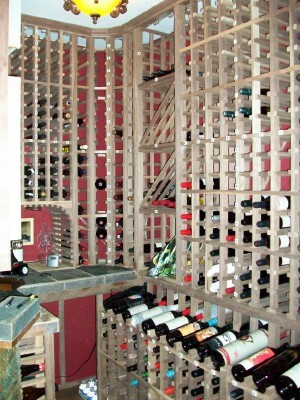 An unused closet, pantry, or even a bathroom could be converted into a wine cellar. 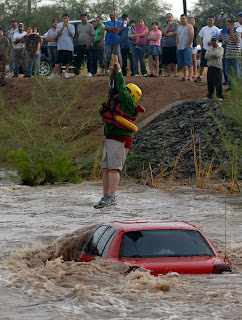 Fred and Patricia Kagie of Gilbert, Arizona did exactly that. Their home has a two story ceiling over their first floor dining room. They took about half of an overlooking loft space, walled it in, and converted it into a wine cellar. 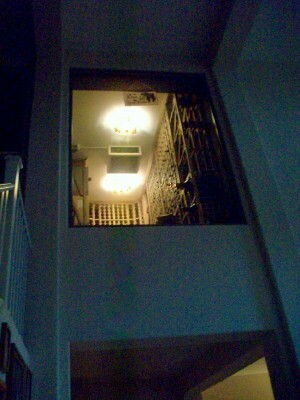 This second story wine cellar is without a doubt the most impressive above-ground cellar I’ve seen. 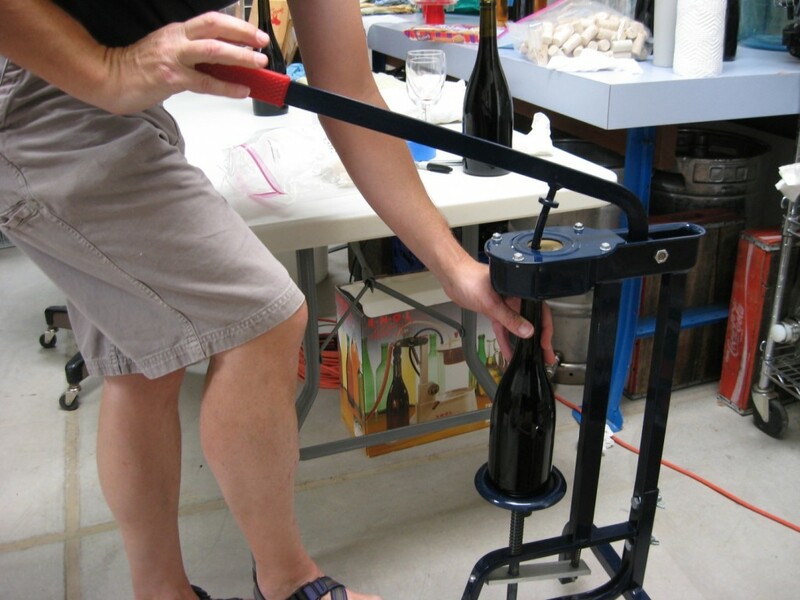 The Kagie’s are both avid wood workers, which is a definite advantage when it comes to building wine racks. These custom racks are made from Black Walnut and can accommodate 1340 bottles in single and double racking; combined with X racking and case storage this cellar can accommodate between 1700 and 2000 bottles. 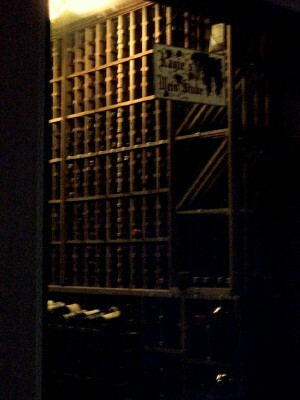 The racking is made to accommodate bottles of various sizes, from splits to six liter Imperials or Methuselahs. This cellar occupies about 72 square feet (650 cubic feet), which wouldn’t be a lot for a bedroom or a study, but it makes for a huge cellar. Cooling is provided by two 4000 BTU refrigeration units, and humidity is maintained by a four foot water fountain. There are a number of wine cabinets available in case you don’t have a hill to dig into or unused floor space to convert. These cabinets are made by Sub-Zero, Vinotemp, Le Cache, and others. These cabinets come in a wide range of sizes, and there is a correlation between capacity and cost, but you can expect to pay between $1,500 and $4,000 for many models. Capacities generally range from 150 to 800 bottles. Some friends of mine have a Le Cache cabinet that can handle 475 bottles. They’ve had it for about nine years and have had no problems with it at all. The only drawback they report is the lack of space for larger bottles. Only the top rack can accommodate those bottles, which is somewhat limiting. This is a very quiet and reliable unit. Others I know have a Vinotemp cabinet. The racking is more flexible than the Le Cache, but this unit is very noisy and it had a compressor failure out of warranty. It appears that these issues are not unusual. If you are considering a high-end wine cabinet, definitely do your research. There’s a lot of information, reviews, and customer comments online. Ok, so what if you don’t have a hill behind your home to dig into, unused floor space to convert, or a few thousand dollars to spend on a new high-end wine cooler? Well, there are other options available. You could get an inexpensive cooler at your local home center, or simply use a refrigerator. Set to the highest temperature, many refrigerators maintain a nearly perfect 60° F. If yours doesn’t maintain the right temperature you can get a plug-in thermostat control at many home centers. 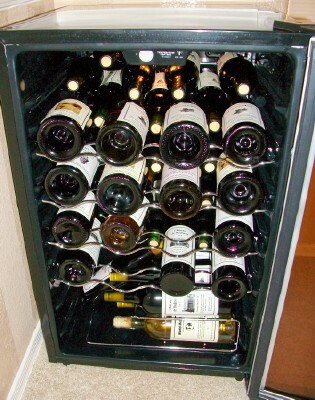 The small wine coolers like the Magic Chef shown at the top can usually accommodate between 42 and 52 bottles. Perhaps more if you are creative. Refrigerators vary in size, but many can hold 100 bottles or more. While those in the wine trade will often tout the benefits of the high end Sub-Zero and Vinotemp coolers, they will sometimes quietly admit that at home they have an inexpensive Magic Chef unit. The high end units are nice and they have some advantages, but they not only cost a great deal up front, should they ever fail they are expensive to repair. These inexpensive units hold up quite well, but if they ever do fail, just pitch them and get a new one. If you’re in the market for one of these coolers, shop around. Sometimes you can find a scratch & dent or floor model at your local home center at a sizable discount. Craig’s List can be a good source for second hand units. Inexpensive refrigerators can sometimes be found at Goodwill. The lack of humidity in these small units and refrigerators doesn’t seem to be a big issue, but it can be bolstered with a small tub or bowl of water. 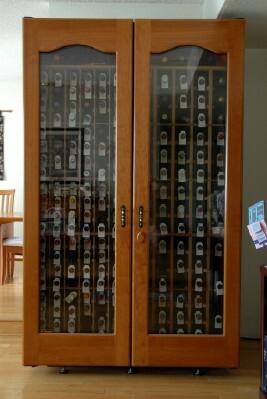 No matter what your budget or circumstances, there are options for cellaring your wine. 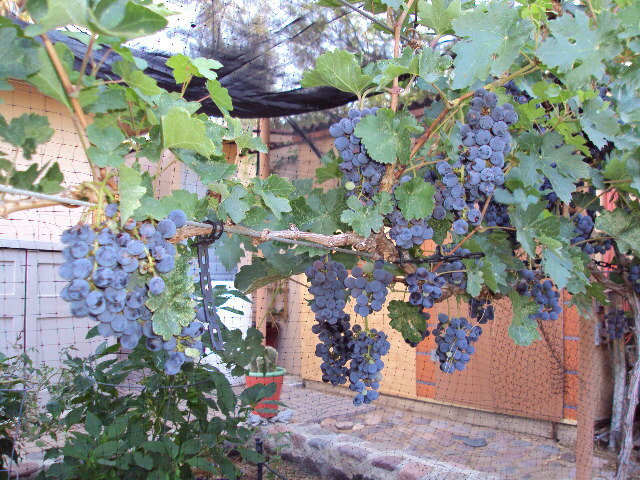 2011 was a poor year for my backyard vineyard. Cathy and I were able to harvest only a third of the amount of grapes we got last year. This year we decided to try something a little different. Because of the equipment I have I wanted to try a whole cluster fermentaion. I have an antique crusher with a wooden hopper. 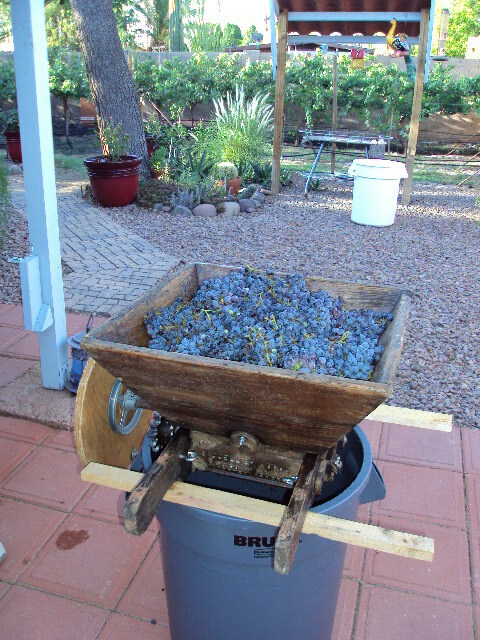 I adjusted the crusher for the most separation possible to keep the grapes mostly whole. Last year I used a milk crate as a destemmer, it was alot of work and my least favorite part of the job. I also have a basket press. This year I’ll press the stems with the must and make easy work of it. 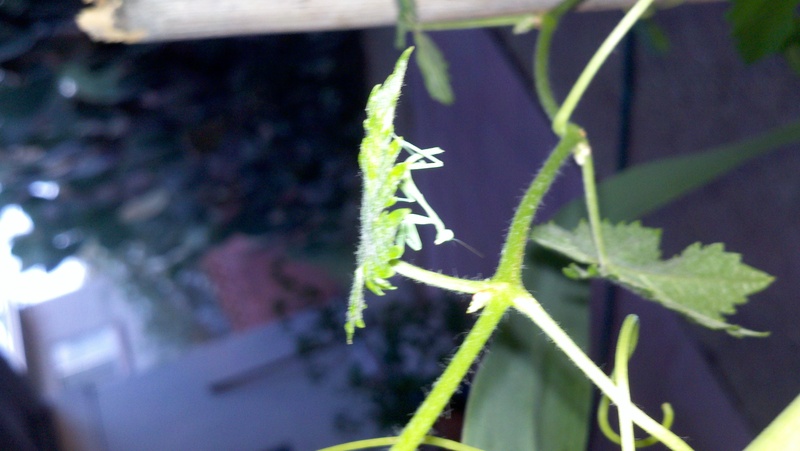 We’ll have to wait and see if the stems leave any off taste in the wine. I’ll let the club members be the judge of that at a meeting next year. We decided to bottle last year’s wine today to make room for this year’s harvest; the first from our vineyard. 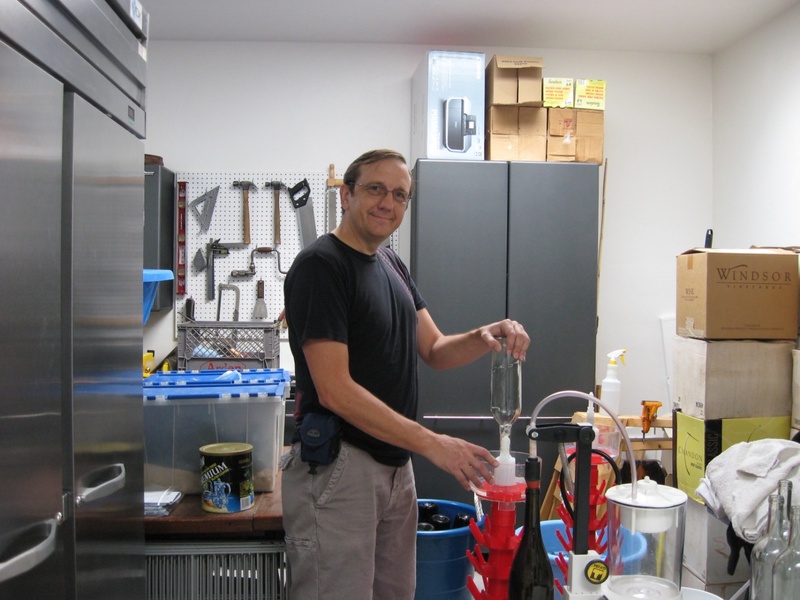 Making wine can be a messy job, so I prefer to keep the mess in the garage. A portable swamp cooler makes it bearable inside while we’re working. 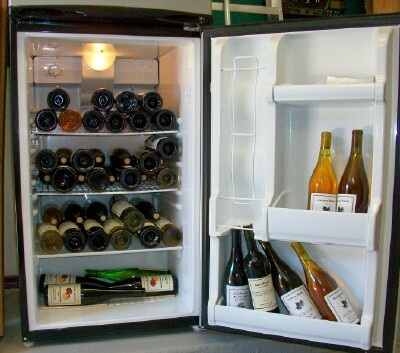 I use a double-door refrigerator to keep the wine at the proper temperature during fermentation. Maybe someday I’ll set up a cellar, but for now the finished wine goes in a spare room in the house. 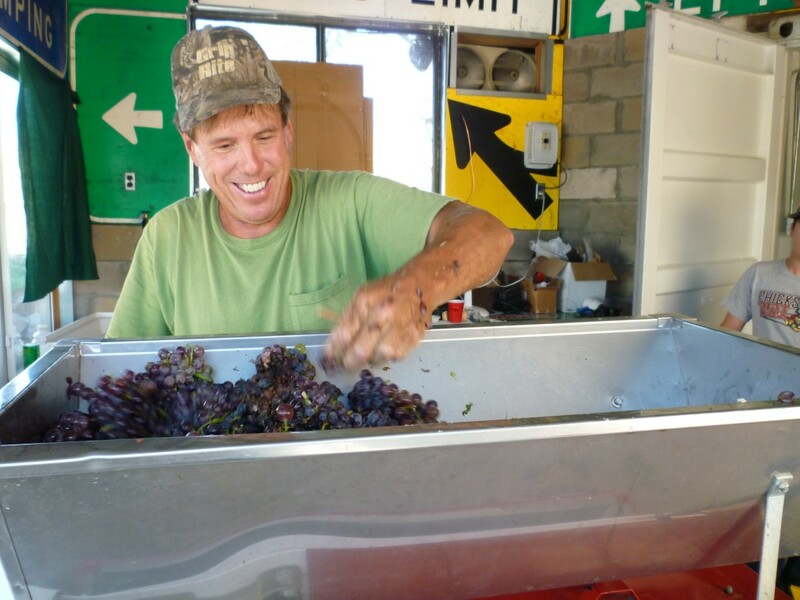 Ken Hilkemeyer and I made the trip last summer to Mexico (see Adventure Harvesting Grapes in Mexico) to pick up the grapes, and brought them back to my house to crush. We decided to make some rose, but the press was too underpowered to press the whole clusters. So, we ran some grapes through the crusher first and then pressed. This was still a tough job for the old press, so we decided to stop at 6 gallons and split the batch between the two of us. Ken made the rose and gave me 3 gallons once it was past the primary fermention. The rest we split, and fermented as reds. The rose is very light and a bit fruity with an amber color. This will be nice served chilled. The Tempranillo is still young, but it has nice fruit flavor and smell. I think it will age nicely. A bottle tree and injector (pump) makes sanitizing quick and easy. Bottle filler at work. This makes short work of the 30 gallons we had to bottle. It takes a bit of fiddling to set the proper fill level, but I’m very happy with it. 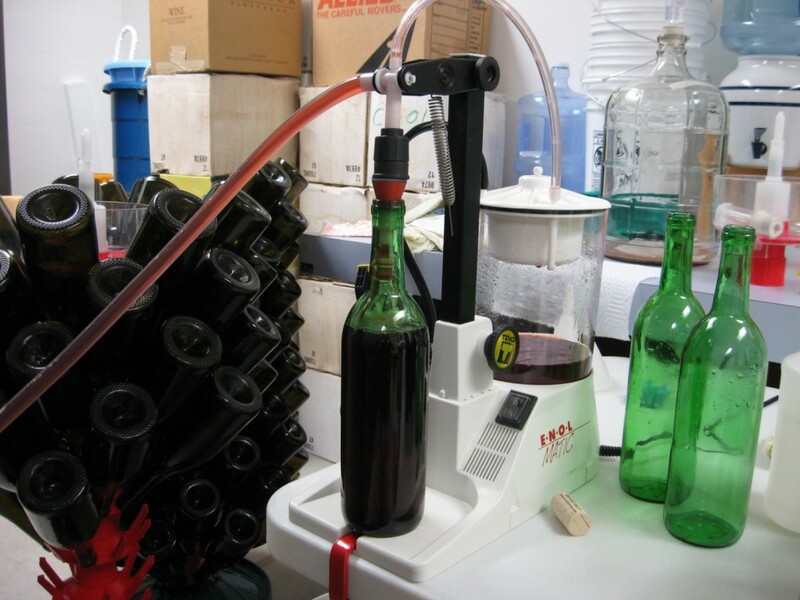 The vacuum level can be adjusted to fill quickly without much foaming, as can be seen in the bottle being filled above. The overflow gets captured in the clear container on the back of the filler. The more practice I get using this, the less ends up in the overflow container. These fillers can be quite expensive. I picked this up used for a good price. But, there are many versions out there from the siphon hose with a spring loaded tip to the multi-bottle commercial versions. A floor corker is so nice to have when doing several cases. These show up on Craigslist every now and then and aren’t too expensive.